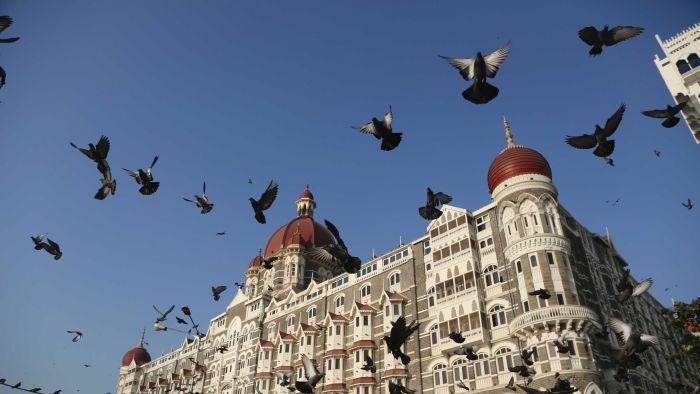 As Mumbai on Monday marked the 10th anniversary of the attacks that killed 166 in India’s financial capital, the United States offered a new reward for information about the 2008 siege. The gunmen who waged the attack were killed or captured. The US Secretary of State says the plotters have not been convicted. India believes Pakistani intelligence was behind the attack. The Pakistani gunmen who waged the attack were killed or captured. But US Secretary of State Mike Pompeo said those who planned the attack had not been convicted. He called on Pakistan to implement sanctions against those responsible and said the US was offering a new $US5 million ($6.88 million) reward and was committed to seeing those responsible face justice. In Mumbai, the Chief Minister of Maharashtra and part of the ruling Bharatiya Janata Party, laid a wreath at the Police Memorial which was constructed to honour the policemen who were killed in the attack. Divya Vijay Salaskar, whose father was killed during the attack, said though her family had come a long way, “the pain is very much the same”. The gunmen targeted two luxury hotels, a Jewish centre, a tourist restaurant and a crowded train station during the three days of carnage in 2008. Shyam Bihari Paswan, who owns a small shop inside the station and was shot in the shoulder during the attacks, said he had stopped watching action movies because the scripted gunfire reminds him of the attack. India blamed the attack on the Pakistani militant group Lashkar-e-Taiba, throwing relations between the nuclear-armed neighbours into a tailspin. Indian officials accused Pakistan’s intelligence agency of working with the militant group to mastermind the attack — an allegation Islamabad denied. Previous articleWhat happens to the bodies of those who die in the Mediterranean?